This page was added by Laura Matthews on 09/01/2007. My father was manager at this shop in the 1960s. On the subject of shops I lived at Swirles buildings just off North Market Road and about 50 yds from St Nicholas Road where now stands a large super market. In the late 1940s-1950s there was a fish shop owned and run by a Mr Arthur Butler, his mother and another relative. I had an after school job delivering fresh fish, Kippers and Bloaters to hotels, boarding houses and private customers, collecting the money once a week. Every two weeks I went to the Beach Railway Station on the trades bike to collect a cwt sack of cockles that came from Wells-on-sea. At the back of the shop was a large yard Arthurs. My mother used light a fire on a brick built copper to boil the water I remember we cooked all types of shell fish in there across the yard was a smokehouse where fresh Herring were prepared for turning into Kippers and Bloaters. I also had to go on the bike to theSouth Quay to a place called the ICE HOUSE to pick up a sack of crushed ice in the front basket of the bike, it was a hairy ride back along the quay dodging in and out of the railway lines, I must admit to many a spill. Arthur used to lay out the windows with fresh fish everyday it looked really nice. Near to christmas we also had fresh poultry chickens, ducks, geese and turkeys but only on orders. I learnt a small part of cutting and filleting fish which I can still do today. When I go into a supermarket and see the fish counter it brings back all those happy days. Does anyone remember Butlers or Mr Blithyes the bakers next door or even Grouts silk mill factory? Every year my Mum and Dad use to send home some bloaters from this shop. As recent as two years ago i sent one home to my Dad. Sadly, they dont do the service anymore, but you can can still get a bloater in the shop. I use to love the big bloater sign as a kid!! Do they still post Kippers (SMOKED) IF SO WHAT IS the price? When I was on Holiday I sent every one a box. I get them from M&S now but it's not the same, happy days. When I was at school I used to work in this shop,my mother and eldest sister also used to work there, in the winter they used to make all the rock ready for the summer season. I remember Geoff Cuthbert the manager very well. What magic it was on arriving at Yarmouth for a weeks' holiday to see the Bloater Depot and its wonderful fish sign! It was a sure sign that we had arrived after a 3-4 Hour journey. Then it was on to the South Denes caravan site to find our new home for the week.It was magical to see the Nelson Monument and to explore the quayside for the best site for a spot of sea fishing. I can still imagine with much nostalgia the smell of bloaters cooking in the van for our first tea! What happy memories!! I worked in the Bloater Depot/Rock Factory after school and at weekends in 1962 when I was 15 years of age. The business was owned and managed by the Sutton family. I earned just ten pence halfpenny per hour but on Sundays at 'double time' ie 1/9d per hour, could earn 14 shillings over 8 hours. I earned enough in 6 weeks to buy my first suit from Burtons. Geoff Cuthbert the shop manager was quite a character and he always wore a trilby hat. He showed me how to 'sell' by filling a customer's carrier bag full of various types of novelty rock and then charging the customer more than the actual total price - but then 'giving' the customer a complimentary piece or bag of rock supposedly for nothing! The kippers and bloaters sold were displayed on a slab in the front of the shop and part of my job, when not helping to make the seaside rock and filling the novelty rock displays, was to 'freshen up' the fish by brushing them with gelatine solution. There was a paint brush and pot of gelatine kept specially for this purpose. Upstairs where much of the novelty rock packing was done there was rumoured to be a ghost but I never saw it . However, other shop workers claimed to have had ghostly experiences there. The kippers and bloaters purchased by customers were packed in small wooden trays and lids were stapled on before depositing them into the post box inside the shop. I can still hear the sound of the staplers and Geoff Cuthbert enticing holidaymakers into the shop by shouting, "Come inside! They're LOVELY!!" After working at the Bloater Depot/Rock Factory for two months I decided to leave because I was offered a better paid job (One shilling per hour) at Vettesse's but I hated it there . My duties were table clearing and washing up using a giant dishwasher. The novelty of free coffee, ice cream and coke at break times soon wore off and I left after a few weeks to work in Fine Fare Supermarket opposite the Bloater Depot/Rock Factory. Fine Fare Supermarket sold sugar as a 'loss leader' at just 11d (that's almost 5p) for a two pound bag. Mr Sutton at the Rock Factory asked the Fine Fare manager if he could buy 5 tons of sugar at that price and a deal was agreed. We loaded it onto a Sutton's truck and helped unload it at a Sutton's warehouse on the fishwharf. By that time my hourly rate was 2 shillings an hour and 2/6d per hour on Saturdays which seemed to be a fortune whilst still at school and college. I now live in Peterborough where I'm semi-retired after working for nine years at the Identity and Passport Service. Just to touch on the subject of Vettesse, I remember that the family use to live above and at the rear of their icecream parlour near the top end of Regent Road (the sea front end) next door to what was the Queens Hotel. In the middle of Regent Road, opposite the Regent Cinema, in their other icecream parlour was a good friend but much older than I (Rose Vettesse). When I last visited Yarmouth I see that Vettesse's are no longer in bussiness, but I wonder where my very good friend Rose is. Any replies. I remember the Bloater Depot more as a rest place for the Yarmouth blue bus crews. The boss at that time i believe was Harry Taylor, he let us have use of an upstairs room to have our breaks as most of them were in the town centre. I do remember the fish and chips were superb. I remember Duncan Kirkwood as he to worked for the blue buses in the late 1960s. It was a great shame when the council, ill advised, sold it to eastern counties, but I still have fond memories of those days and making some good pals. To Colin Browne ,Rose Vetesse married into the Pownall Family who owned the Fishing tackle & Toy shop on the right hand side of Regent Rd a few doors from my family's business, the Regent Restaurant. She had three sons & a daughter, sadly she died about four years ago. My Nan Lily Bellin used to be the fish fryer at the Bloater Depot when Harry Taylor owned it. She also managed the fish'n'chip shop at the top of St Peters Rd, then owned by Edgar Barker. She kept hopping from one shop to the other, as she was a renowned fryer, everyone wanted her, I helped out sometimes at the St Peters Rd shop and customers there used to tell me they wouldn't go anywhere where my Nan wasn't working, they regarded her as the best fryer in Yarmouth. I worked for a stint at Potters Rock shop, next door to the Bloater Depot, in 1981, rolling and wrapping the rock. I must admit, I didn't see any spooks up the stairs, which is unusual for me! Blast Bor Oi remember that shop from 50 year ago. Originally came from Acle and my parents moved to Great Yarmouth in the early 50's. I took off into the Royal Navy. But always enjoyed herrings, bloaters and kippers when on leave. I have been in Western Australia since 1968 and certain miss even now the fish from the North Sea. Ah memories, I can still remember all the "Herring Girls" on the South Quay, - you gave them lip and you soon ended up with a half gutted herring wrapped round yer lugs !! Those were the days when drifters lined the entire river packed to the Haven Bridge often 3 or 4 deep. 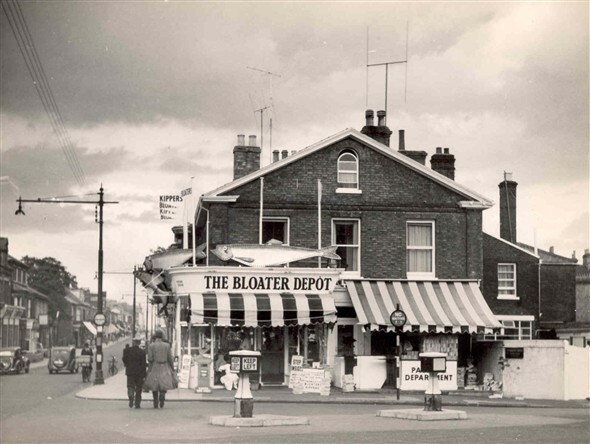 I also worked at the Bloater/Rock Shop for a few weeks during the summer in 1954. I had to stand outside in the street and beckon the 'customers' to come and buy. I sent many a box of bloaters/kippers for my customers. Enjoyed those few weeks, but can't remember anyone's name who worked there then. I was born in 56 and remember the old Yarmouth very well, how things have changed, not for the better either. Just want to know if anyone can remember a shop where the McDonald's or Kentucky is that used to sell macs and coats; opposite Mastersons wet fish shop where you could buy bloaters to send to people. I worked at the Rock Factory and almost sure I worked with your mum Marie Tatnell, a lovely lady, we had lots of laughs. That was in the 60s.